“Serving Society with Technology” is the philosophy of Chiyoda’s foundation. Bearing this in mind, we have undertaken research and development, demonstration projects and commercialization of energy and advanced environment-related technologies. Making the most of our strengths as an engineering firm, we are able to take such a comprehensive approach to research and development as it is integrated with process development, design and system analysis. With this approach, we have carried out technology development both on our own and in cooperation with our clients and technology owners, aiming for commercialization and problem-solving based on society's ever-changing demands. We will continue our efforts to contribute to solving new issues including materializing a low-carbon and carbon-free society. Based on high performance catalysts and membranes, we aim to develop new processes to enhance energy efficiency dramatically in comparison to conventional processes. For the effective utilization of renewable energies, the issues of regionally uneven distribution and time variation should be addressed, and we have developed the energy storage and transportation technology to clear them. We are developing technologies to store CO2 into the deep see floor and convert CO2 to valuable chemicals. 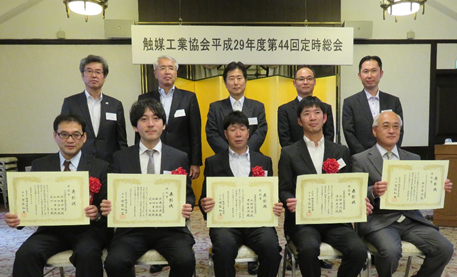 Chiyoda won the FY2017 Catalyst Manufacturers Association Japan Technology Award for the development and practical application of CT-HBT®*, a catalyst for the hydrodesulfurization of kerosene and diesel oil. CT-HBT® is a catalyst that uses an alumina substrate with a titanium coating as a support. This catalyst exhibits high hydrodesulfurization activity with refractory feedstock and is therefore able to improve the conversion rate to diesel oil of catalytic cracked gas oil (light cycle oil, LCO) produced in a fluid catalytic cracker (FCC). Improving the rate of conversion from LCO to diesel oil contributes to the effective use of feedstock as well as to the reduction of air pollutant emissions. With the momentum provided by this award, we will actively engage in further development of this catalyst in order to reduce the impact of harmful emissions. Chiyoda's energy and environmental technology that creates the future. Chiyoda's Change to Contribute to the Realization of a Prosperous Society. CT-CO2ARTM (Chiyoda CO2 Reforming Technology) is a unique and advanced technology utilizing CO2 as reforming agent to efficiently produce synthesis gases of varying H2/CO ratios. Synthesis gases are the feeds for producing various chemicals and liquid fuels (GTL-fuels etc.). 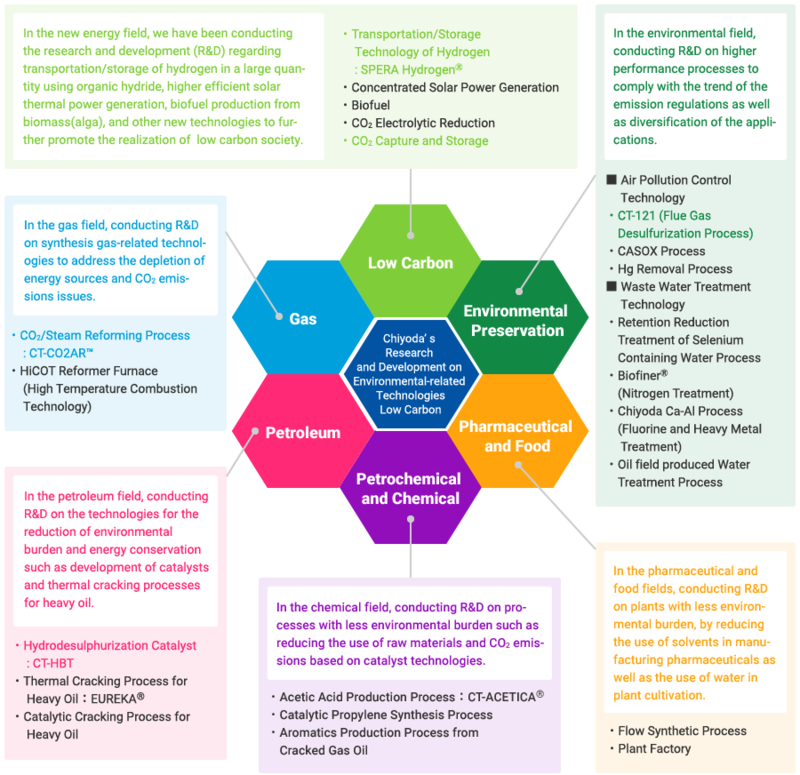 This technology enables monetization of low-calorie, CO2-containing natural gas fields and can also be applied to efficiently reuse CO2 emitted from various industrial processes. CT-CO2ARTM can also reduce CO2 emissions, capital investment and operating costs significantly. For example, producing syngas with an H2/CO ratio of 1.0 (suitable for oxo-synthesis, etc), CO2 emission, capital costs, natural gas consumption can be reduced 37%, 20% and 12%, respectively, as compared to conventional technologies. CT-CO2ARTM is thus, an environment-friendly technology. which is conducting an experimental demonstration project in Tomakomai, Hokkaido Island. 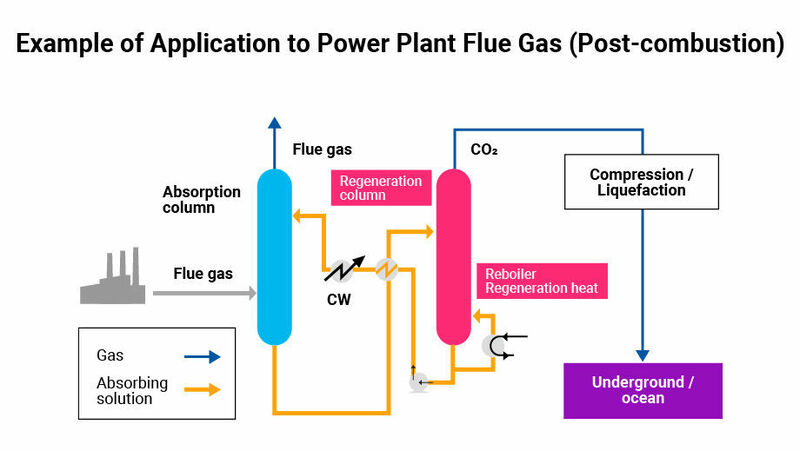 EPC for post combustion CO2 capture experiment project for a Coal-fired Power Plant in Fukuoka, Kyushu Island. 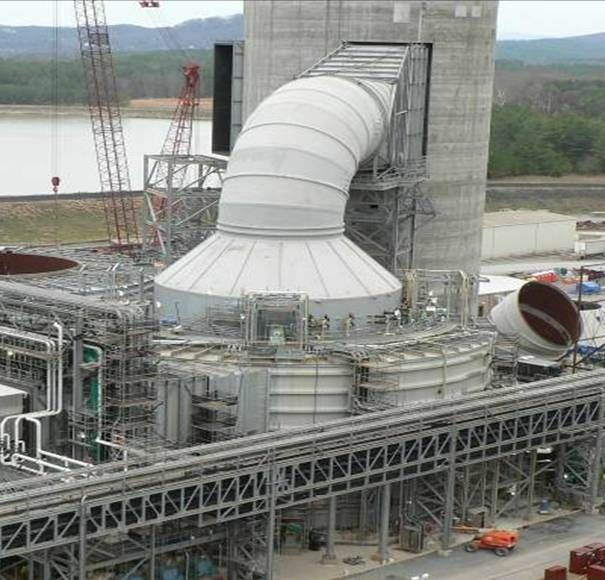 The Chiyoda Thoroughbred 121TM (CT-121) Flue Gas Desulfurization (FGD) process is a unique technology developed by Chiyoda which is highly efficient, enabling the low-cost removal of flue gas sulfur dioxide (SO2) and dust. There are 83 CT-121 units worldwide, and where environmental regulations are stringent, the CT-121 process has more than 20 % share in Japan and the US. India, with its robust and rapid economic growth, is in need of power plants to sustain their development under newly adopted strict emission gas standard for coal-fired power plants and the demand for FGD plants is increasing significantly. Chiyoda Corporation has been proposed the global hydrogen supply chain concept by liquid organic hydrogen carrier (LOHC) with Toluene/Methylcyclohexane system. In this method, hydrogen is fixed to toluene (C7H8) with the hydrogenation reaction and converted into methylcyclohaxane (MCH: C7H14) that is able to be transported with a chemical tanker as same as toluene. In the demand site, hydrogen is generated from MCH by dehydrogenation reaction, and toluene is recovered for the recycle use. LOHC is suitable for large-scale storage and long distance transportation due to the ambient condition with the low potential risk. Removal of sulfur from gasoline or diesel oil leads to the discharge restraint of the air pollution material and plays a big role for reduction of the environmental load. Chiyoda has successfully developed and commercialized the novel Chiyoda Hybrid Titania (CT-HBT) catalyst for catalytic hydrodesulfurization of distillate (kerosene, diesel oil). CT-HBT catalyst has both the superior reactivity of the titania catalyst and superior material properties of the alumina catalyst. CT-HBT catalyst has been installed into the hydrodesulfurization unit for kerosene/diesel oil at Yamaguchi refinery of Seibu Oil Co., Ltd. as the commercial first unit. This unit has shown satisfying performance through block operation between LCO (Light Cycle Oil*) mixture diesel oil and kerosene since a startup in January, 2014. CT-HBT catalyst which has high desulfurization activity is able to convert LCO of difficulty desulfurization characteristics to a value-added expensive diesel oil product. For example, LCO obtained as by-product from FCC (fluid catalytic cracking) unit have been able to be slightly mixed with GO (Gas Oil) fraction because of it’s difficulty in desulfurization and most of them have been used as the diluent of the heavy oil until now, but CT-HBT catalyst make it possible to mix the comparative amount of LCO and turn it into a value-added high diesel oil product. Chiyoda continue development of CT-HBT catalyst aggressively based on these results and contribute to the reduction of the environmental load. Catalytic cracked gas oil obtained from FCC unit with feed of VGO (Vacuum gas oil) or residual oil.